Recent statistics show 69 percent of people between the ages of 35 to 44 have lost a tooth, and 26 percent of adults have loss all of their permanent teeth by the age of 74. With permanent tooth replacement treatments such as dental implants becoming more popular, a Chicago cosmetic dentistry office is using a unique incentive for patients who don’t want the hassle of long waiting periods and multiple office visits for teeth replacement and other dental options. Dentists at Chicago implant dentistry The Dental Implants Associates have set out to distinguish their practice from others, and so far, one of the ways they’ve done that is by cutting the time and hassle that many patients must go through when getting treatment for missing or damaged teeth. Doctors at the practice say by establishing their own on-site laboratories and sterilization facilities, the need for long waiting periods and multiple trips to dental offices can be significantly reduced. Dentists at the practice say the on-site labs enable the practice to provide patients with a high level of customer service and advanced, state-of-the-art care in one place. By creating patients’ dental implants and other materials on their own premises, The Dental Implants Associates can offer advanced dental technology with a shorter wait time than other practices who are not equipped to do so. The technicians at the Dental Implants Associates lab create customized dental implants and porcelain veneers without having to use off-site laboratories. This means that the patients’ entire dental treatment, from start to finish, is in the hands of the practice’s own staff. Because all steps of the cosmetic and restorative treatments are performed on-site, dental implants and other advanced dental solutions can be performed without the patient having to wait a long time between appointments. Chicago porcelain dental veneers and dental implants patients can meet with the dentists at either one of the practice’s two locations and discuss their goals for treatment. The dentists plan out every aspect of the dental implants procedure in advance, including the type and location of the dental implants. Then the specifics for each implant are given to the practice’s technicians, who custom-create the natural-looking replacement teeth based on each patient’s individual needs and goals. Porcelain veneers, the thin ceramic shells that are placed over teeth to hide imperfections, are also created in this manner. Patients can also tour the practice’s on-site laboratories and see first-hand how advanced technology is used each day to provide customized, cost-efficient treatments. 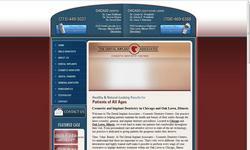 The Chicago cosmetic dentists that are on staff at The Dental Implants Associates are among the best in their field. The dentists at the practice’s Chicago location are Dr. Larry Hoffman, Dr. Steven Flicker, and Dr. David Sher. The dentists at the practice’s Oak Lawn location include Dr. Linda Weinfield, Dr. Edwin Weinfield, and Dr. Linas J. Bartuska. They have all graduated from distinguished dental schools, completed advanced training, and are members of prestigious organizations including the American Academy of Implant Dentistry and the American Board of Oral Implantology. The practice’s Chicago office is located at 6258 North Lincoln Ave, Chicago, Illinois 60659 and can be reached by phone at (773) 449-5037. The practice’s Oak Hill office is located at 9839 Southwest Highway, Oak Lawn, Illinois 60453 and can be reached at (708) 469-6388. http://www.dentalimplantassociates.com.